The MyLight Bed Light is a brand new way to light your bedroom to give light without fumbling for switches in the dark. 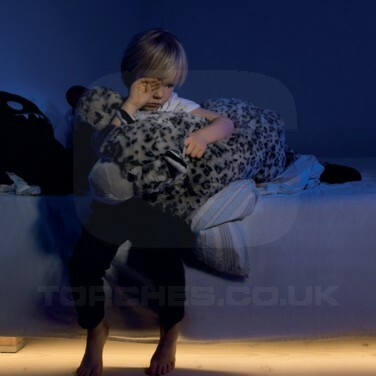 The LED lighting strip fits discreetly to the underside of your bed, your child's bed or cot and motion sensitive LEDs are activated when they detect movement giving light for between 30 seconds and 10 minutes (depending upon your settings). A soft glow will then illuminate your room gently allowing you to see as you move around your room without disturbing others with light using dimmable LEDs to give you control. Ideal for families with small children, night feeds and toilet trips need no longer wake everybody in the house and the gentle glow gives guidance without a startling bright glare. The stylish, flexible design has a self adhesive backing making it exceptionally easy to install where ever you choose giving motion sensitive light.